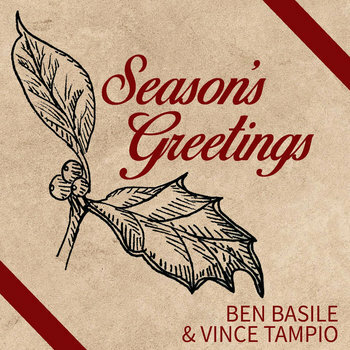 (Philadelphia, PA July 17, 2018) Ben Basile (pronounced: buh-SILL-ee) and Vince Tampio (pronounced: TAM-pe-oh) self release Season’s Greetings, an instrumental chamber jazz interpretation of select Holiday songs. The musical arrangements were inspired by Frank Sinatra, Vince Guaraldi, and Al Green. Season’s Greetings was released Tuesday, November 20, 2018. Ben Basile is an electric/double bassist, educator and composer from New York's Hudson Valley Area. Vince Tampio (M.Mus.) is a professional trumpeter, arranger and composer based in Philadelphia, PA. “Basically he’s the go-to cross-genre horn-blowing utility man of the Philly scene” (John Vettese WXPN’s The Key). For Season’s Greetings, Basile plays upright bass and percussion, Tampio plays trumpet, flugelhorn, guitars, tanpura, and percussion. Season’s Greetings features hand selected Holiday favorites arranged and performed by Ben Basile and Vince Tampio; Tampio also served as producer and engineer. The two musicians have been collaborating since college. Album collaborations include Tampio’s The Nook (2018), Basile’s Two For Twenty (2016), and their A Duo Tribute to Frank Sinatra (2015). All tracks on Season’s Greetings were recorded at S.A.V. Studios, Philadelphia, PA. The above album cover photo is available to download by clicking the thumbnail. Ask Ben Basile what his passion is, and he’ll tell you definitively, it's music. Since his teenage years, the Hudson Valley native has dedicated much of his time to practicing and perfecting his craft on the bass guitar. Ben first touched a bass in high school after seeing his best friend lose interest in the instrument. Ben decided to pick it up himself, not knowing how far it would take him. His initial curiosity became a deep-rooted love for not only the bass guitar, but many different genres of music. To further his skills, Ben studied music during his final year at Dutchess Community College in Poughkeepsie. Ben attributes much of his success at DCC to the chair of the music department, Dr. Christopher Brellochs. Upon graduation, Ben decided to further his musical education by attending SUNY New Paltz for his Bachelor’s of Science in Music. Focused primarily on jazz studies, he also played with various groups, which allowed him to not only develop flexibility but also his own style and flare. Ben’s time at New Paltz culminated in his senior recital on April 16, 2011, just before his 23rd birthday. Basile's first professional tour was in 2013 with NYC ska/reggae group "Pilfers," an opportunity that lead to traveling with world with "Big D and The Kids Table" and "The New York Ska-Jazz Ensemble." Currently he has performed in 30 different countries, across 6 continents. When he is home in the Hudson Valley, Ben performs regularly with the "Poughkeepsie Jazz Project," "In The Pocket," and various other local groups. Basile is also a founding member of the “Poughkeepsie Jazz Project” a group which supports the local jazz community and runs a weekly jazz jam session since 2012. Ben released his debut album "Two For Twenty" on November 15th 2016. In his free time, Ben enjoys cooking, watching Woody Allen films, discovering new music, and being outdoors. Ben has been dedicated to maintaining a healthy, drug and alcohol-free lifestyle throughout his career. While Basile is no doubt on the “up-and-up,” he remains humble, and is thankful for the opportunities that have come his way. “Basically he’s the go-to cross-genre horn-blowing utility man of the Philly scene” (John Vettese). Vince Tampio is a professional trumpeter, arranger, composer, and multi-instrumentalist based in Philadelphia, PA. Although firmly rooted in jazz, he is comfortable with a wide variety of genres including rock, soul, funk, folk, classical, and electronic. Vince’s original music has been described as “a contemporary instance of fusion done right,” and whose “nontraditional instrumentation maintains a spacious environment that proves ideal for a set brimming with imaginative, drawn-out improvisation” (Matthew Aquilin All About Jazz). His next album, The Nook, is a full length straight-ahead jazz album featuring John Swana. The music harks back to Miles Davis' first great quintet. The Nook was preceded by Sound Plan (2017), Sound Plan, Live at PafA (2017), Syzygy (2014), and Syzygy: Remix (2014). Vince is currently self producing four more solo albums. One unreleased composition was recently featured in the Philadelphia Real Book Volume 1. Vince has appeared as a side man on 30+ albums. He is the trumpeter and arranger with the York Street Hustle, the John Byrne Band, the Cat’s Pajamas, and You Do You. Vince founded the Philly Phatness horn section, which has recorded with regional, national, and international artists, and on film soundtracks. "His horn croons and wahs with touches of funk or blues, bridging the futuristic digital age with a snazzy sense of classic cool" (Geno Thackara All About Jazz). Vince also writes and arranges for the Uptown String Band, a member of the Philadelphia Mummers String Band Association. Vince earned the Masters of Music degree in Jazz Performance from the University of the Arts; and earned the Bachelor of Science in Music degree concentrating in Jazz Studies and Theory & Composition from the State University of New York (SUNY) at New Paltz. He studied trumpet under John Swana, Rebecca Coupe Franks, and John Maguda, and studied composition under Don Glanden, Evan Solot, John B Hedges, and Vinnie Martucci. Fast becoming a sought after trumpeter and arranger, Vince continually pursues work performing, arranging, composing, teaching and recording original music.